Happy! 節約生活 in アメリカ: Toys"R"Us: Lego Chima Build Your Own Speedorz Challenge on 7/27 12-2 pm! 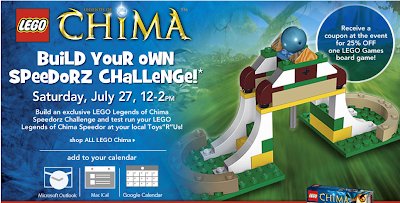 Toys"R"Us: Lego Chima Build Your Own Speedorz Challenge on 7/27 12-2 pm!